in Brazoria County. With the help of several Brazoria County community and business leaders, Gina founded the chamber in 2011. Before that, Gina served as the Vice President of the Latina Women in Leadership. She currently serves on numerous civic boards and business committees in the area. 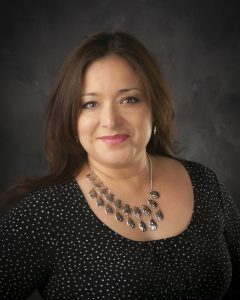 She is on the Community Advisory Panel for the DOW Chemical Company, and is the Vice Chairperson for the Community Health Network, BISD Education Foundation, the Texas Association of Mexican American Chamber of Commerce, member of the Lions Club and of the Latina Women. Gina also served on the boards of the BISD Leadership Group, and District Educational Improvement Committee (DEIC). Gina helped with the creation of the Comité Esperanza de la Voz Hispana, formerly known as Educational Voices Advisory Council (EVAC), which is a partnership that has been developed between the Hispanic Chamber and the local school districts. This is beneficial for the school districts, local businesses, and the underserved Hipanic community that struggles with a language barrier. She was also appointed by Governor Greg Abbott to be a member of the Texas Workforce Investment Council. In this position, Gina will assist the governor and Legislature with strategic planning and evaluation of the Texas workforce system to promote the development of a well-educated, highly skilled workforce. With a strong background in nonprofit work and leadership, Gina is an avid believer in building partnerships between communities and businesses. She received a Nonprofit Executive Program Certificate from the University of Norte Dame Mendoza College of Business, and a Professional Education Certificate in Family Engagement in Education from the Harvard Graduate School of Education. Gina has been recognized by the MIMS Community Center, as a “Brazoria County High Achiever” for her contributions to the community. She was also the recipient of the 2016 BISD Extra Mile Award for EVAC Ambassador, the 2014 Freeport’s Woman of Distinction Award, and the 2013-2014 BISD leadership Award.